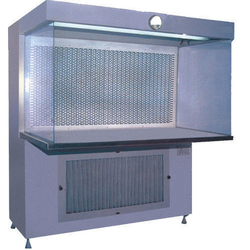 A Laminar Flow is designed to provide working space comprising as standard features HEPA filter having efficiency of 99.97% down to 0.3% microns, prefilter 90% down to 5 microns, suitable motor blowing assemblies, working table topside Acrylic panel, fluorescent tube light & pressure differential Manometer. Inside shelf made of S.S.
Standard Model: 2 X 2ft 3 X 2 ft 4 X 2 ft.
AirClean® Systems manufactures a wide range of ductless laminar flow hoods, workstations and clean benches for creating a particle-free Class 100 (ISO 5) environment. These workstations are available in numerous sizes and styles to meet a variety of applications.